EHRs represent a powerful piece of today’s health care puzzle. The federal government has set forth a series of guidelines and requirements to help digitize all of the country’s health records, resulting in billions of dollars being spent on EHR development and implementation. While efforts to create and implement EHRs have been extensive, expectations for the software may be excessive. 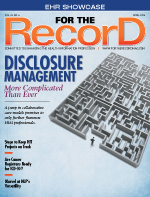 EHRs are health records, intended to capture and store data. While some people may complain they’re difficult to use and resemble antiquated software, they generally fulfill their function of capturing and storing the medical record. And after a decade of bipartisan efforts to transform the US health care system, the industry has become adept at collecting health information. But is the national goal, as set in motion more than a decade ago, to capture the medical record in an electronic format? It may be argued that the actual goal is to use data to improve care and reduce costs. In fact, meaningful use stages 1 and 2 focus specifically on data collection before targeting data use in stage 3. There’s quite a bit of discussion about what stage 3 meaningful use, slated to take effect in 2016, will look like. Will it continue to focus on the electronic record or will it spotlight analytics to address health care’s clinical, financial, and operational aspects? Will it continue to champion minimal interoperability and quality requirements or will it focus on sharing full data and requiring robust quality efforts? For now, the industry has bought what it prioritized: electronically capturing health care information. However, don’t expect successful data capture via EHRs to lead to improved care and reduced costs through analytics. Nor should providers assume capturing data will allow them to use data inherently to boost care. The industry hasn’t yet made that a priority. Using data to improve care will require effort from the government, health care organizations, and technology vendors. Federal leaders must provide interoperability and quality requirements. Only sharing patient summaries largely removes the opportunity to perform population-level analytics. It’s impossible to build robust population health systems from minimal patient summaries. If the government hopes to promote robust use of data, it must reconsider its plans to require only patient summaries in meaningful use stage 3. Health care organizations must be willing to engage in shared risk models and move to value-based care. Fortunately, this already is occurring in some areas. If organizations are held responsible for cost and outcomes, they naturally will try to bolster resources to support those efforts. These organizations should embrace technology that supports risk assessment, quality measurement, and analytics. Without enhanced measurement and workflow to improve care, quality improvement is unlikely. Finally, vendors must develop usable systems that not only address government mandates for reporting and ICD-10 but also offer real, accurate insight into the organization’s financials. Such an initiative should be directed at clinical, operational, and financial levels. The challenge is that the government, providers, and vendors each are waiting for the others to address the problem. Vendors are waiting for a market to be created before building software that improves outcomes and reduces costs. The government is holding off until health care organizations catch up with previous requirements before issuing new ones. And providers are waiting for a sufficient change in payment models to provide a business driver to focus on outcomes rather than chasing federal incentive dollars. Recognizing that incentives are imperfect, how can data be used to address the national goals of reducing costs and improving outcomes? Using data, or improving health care through data, can occur either at the point of care for a single patient or in the workflow of the broader health system to address the needs of a population. Physicians, and often patients, can see point-of-care efforts, which typically occur through an EHR. For example, electronic decision support can help providers ensure consistent diagnosis and treatment. Data analysis typically occurs between visits. Rarely observed by either the physician or the patient, data analysis is a critical component of care improvement. In most implementations, data analysis requires an enterprise data warehouse, several analytics packages, and extensive quality workflow. Clinical analytics efforts often focus on identifying and driving resources toward high-risk individuals, pinpointing care that can be better aligned with national best practices and improved consistency, and supporting preventive care. While decision support and medication reconciliation have led to modest gains in outcomes and costs, population health analytics is believed to offer the highest value in terms of outcomes improvement and cost reduction. It’s reasonable to expect that EHRs will include meaningful clinical decision support at some point. To date, there are only case studies of effective efforts. As EHR usability improves, increased success may be expected, perhaps as soon as the next five years. However, it’s unreasonable to expect that EHRs suddenly will become an analytics system, complete with robust data warehouses and back-end analytics capabilities. With EHR vendors treading water trying to address meaningful use and ICD-10 requirements, there’s scant focus on quality analytics. To complicate matters, there also is limited analytics expertise available. On the bright side, analytics vendors are taking the lead to deliver meaningful solutions. Still, with currently only minimal requirements where analytics would be valuable and a tidal wave of other regulations to meet, the data analysis market geared toward cost reduction and care improvement is small. Meaningful use–supported EHR use is gaining an impressive level of adoption. According to Health and Human Services, as of May 22, 2013, it has met and exceeded its goal for 50% of physicians and 80% of eligible hospitals to have EHRs by the end of 2013. With that said, EHR adoption never was a reasonable intermediate marker for analytics, improved outcomes, or reduced costs. Its primary job is to provide workflow to retrieve and view data. Federal efforts to set and meet EHR adoption goals largely have been successful. However, without establishing criteria for 2014 and 2015 to accurately measure quality, improve quality outcomes, and reduce costs, it shouldn’t be a surprise when efforts in these areas fall short. The next step is to stop measuring EHR adoption rates and instead focus on reducing costs and improving outcomes, goals for which EHR adoption isn’t a proxy. Keep in mind that quality measures tied to national guidelines, rather than process measures, and specific implementations of population health analytics have been linked to reduced costs and better outcomes. The health care industry has taken a meaningful first step toward capturing patient information in electronic form. Now comes the difficult part: creating robust analytical technology that leverages information to improve care across the population. The obstacles are formidable, but there’s a handsome opportunity to derive value from the investment. The industry would be wise to leverage its resources, expertise, and highly trained medical professionals to demonstrate that it’s possible to create an affordable and efficient health system. — Dan Riskin, MD, MBA, FACS, is CEO and cofounder of Health Fidelity, a California-based health care Big Data company.